"It flies by flapping its broad leaves. The bunch of fruit that grows around its neck is deliciously sweet. In the spring, it scatters pollen from its neck." As of right now, this collection of mine is still forming. I only decided a month or two ago to start a Tropius collection, so it's still quite small. My best friend has a Tropius on her Platinum game called Nana. 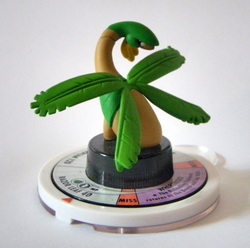 That little bananasaur is what started to make me love Tropius. Plus, its design is just amazing. My gaggle of Tropius! (Taken 20/8/11). The back view ain't that bad either. 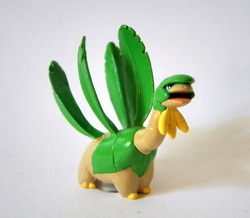 Tropius Zukan, you look so cute with your ever hopeful eyes filled with hope and innocence. I'm quite glad to see you've finally joined my gang. You can't see it here, but he's got his back left foot lifted up, as if he's all "YEH, GOING ON AN ADVENTURRRRRE." Also, this Zukan is the same height as my Venusaur one! Apparently Venusaur and Tropius are supposed to be the same size/weight. I find that a little hard to beileve. Your standard Tomy figure. Little, but wonderfully detailed. 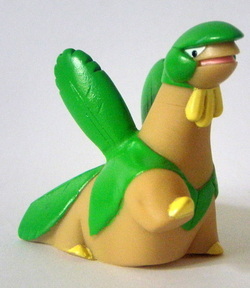 Tropius, close your mouth. You're a disgrace. Did your mother teach you no manners? It seems not since practically EVERY ONE OF YOUR FIGURES YOUR MOUF IS OPEN. Even your plush my GOD MAN. 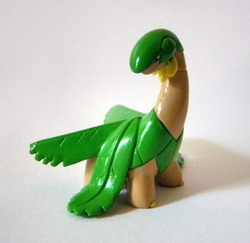 This has to be my favourite Tropius Kid, and maybe one of my favourite Tropius's in general. Different pose and facial expression ftw. It seems this guy is using "Synthesis", you know that annoying attack where Pokemon get to RESTORE THEIR HP? That was the bane of my existance for a long while. 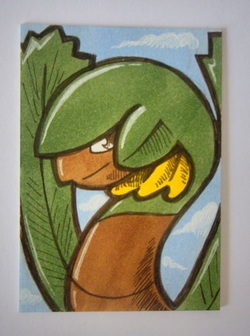 Another Tropius Kid! 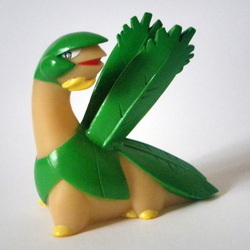 Tropius, what did you do right to get so many Kid figures? Maybe he has a fan at Bandai HQ. Here we can see Tropius about to STOMP WEAK BABY POKEMON INTO OBLIVION. It's like a small version of the Tomy figure. Just a little tanner. And incredibly shiny. Quite a cute little fruit bearing dinosaur. Kaiyado is a company well known for making superb figures with so much detail and dynamic poses. They made one official set of TFG's, then, to many collectors disappointment, discontinued the second set of figures that were soon to be released. A little while later, some unknown figures from a third set start to surface on eBay. After some investigation, it was proven these weren't bootlegs. 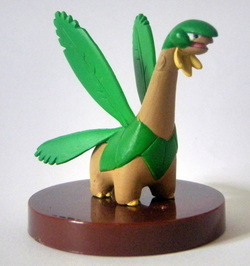 Tropius was lucky enough to be in that third set! 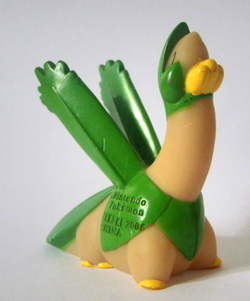 It may be a bit early to say it, but this is the favourite part of my Tropius collection. He's just... sitting on his booty. WHAT'S NOT TO LOVE? Clipping figures are usually made to look like they've come straight out of a picture. So that usually means pretty spiffy poses. This little guy is so... little. He can fairly easily just chill on my thumb. I think he's just come back from a lot of flying, and he's resting his poor little leaf wings. I love this line of merch so hard. 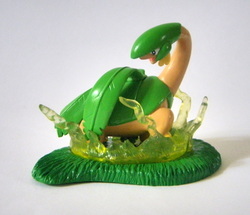 The TM Collection were a bunch of Gapcha prizes, depicting Pokemon using various attacks. 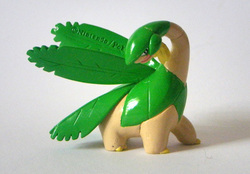 Apparently here Tropius is using "Magical Leaf"! Looks more to me like he's about to take off for a bitchin' Fly attack. All the same, this is quite a fabulous figure. Bandai is like.. Tropius's BRO FOR LIFE. This line of gapchas are for srs dynamically awesome. Things with bases win at life. This guy has one of his feet up, as if he's about to STOMP WHOEVER WILL GET IN HIS WAY. Keshipoke are the newer version of the metal Keshimon. They're made of coloured plastic, and are almost as tiny! 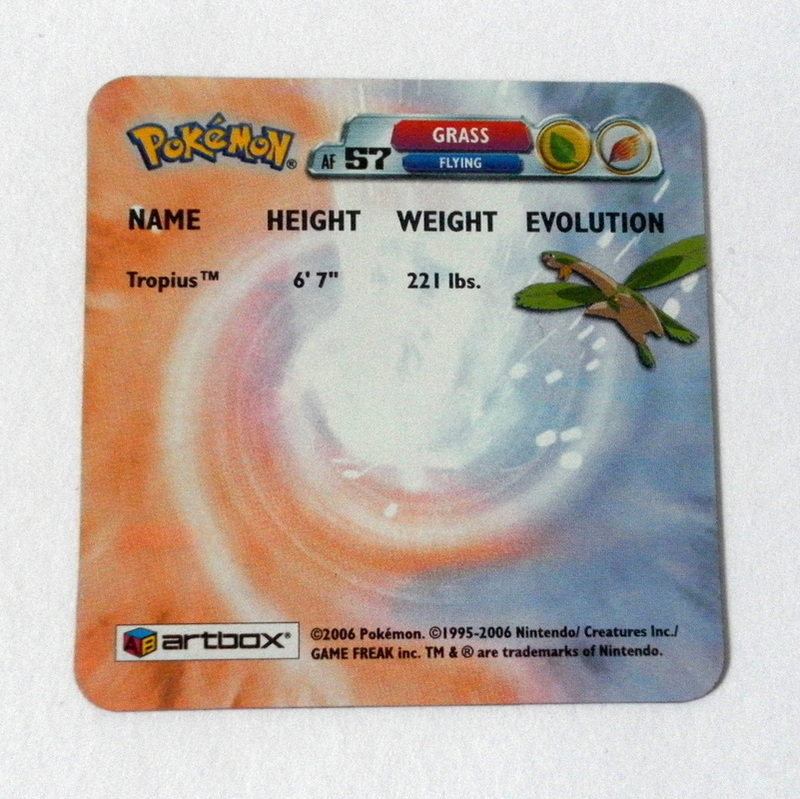 For how small this Tropius is, the amount of detail put in it is really quite impressive! I know it may look a little scruffy, but that's because this is like... 2.5x it's normal size. You know, before I bought these, I always wondered what the big deal was about settei. NOW I KNOW WHAT THE BIG DEAL IS ABOUT SETTEI. It feels so amazingly cool to have official production artwork, plus they're a great reference when actually trying to draw them! Plus all the different poses/points of view. Beautiful. 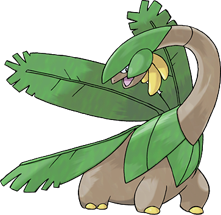 Flying Tropius is so elegant. I remember I had SO many flats like this when I was younger. I always used to buy my food based on the extras included, and I remember some chips always used to have these types of flats inside. So every time I get one, it's a big nostalgia trip. AND THE SECOND IMAGE EMERGES. WIZARDRY. Oh man this card is so delightful! Rocket_chick, being the wonderful person she is, did this for me for free, (as a payback for something I gave her) and sent it as a secret surprise with my LOLSAUR! I see why she gets so many commissions when her slots open; she does such great work with such a small amount of space (about the size of a regular Pokemon Card)!